World’s number one biggest living bird which cannot fly but it can run very fast and sprints at an average speed of 43 miles per hour. Ostrich can easily cover 30-35 miles in an hour. It weighs 220-300 lbs and stands 8-9 feet tall. Its average lifespan is 30 to 40 years. Omnivores Diet is the intake of an ostrich. Ostrich has strong legs which they sometimes use as their weapon. One strong kick of an Ostrich’s leg has the power to kill a human or potential predator like Lion. They have a two-toed foot with sharp claws. Ostrich feathers are loose, smooth and soft. Ostrich lives in the group which helps them in defence in times of danger. It is one of the strange animals found only in Africa. Ostrich or Struthio camelus is the only living member of the genus Struthio and the largest living flightless birds. These are the native of Africa. An adult ostrich weighs up to 156 kg and can be as tall as 6.3 ft. These share a similarity with the extinct bird Moa and with the other members of family Struthioniformes like kiwi, emu and cassowaries. The earliest fossils traced links them with Paleocene taxa of Europe. Their distinctive appearance is due to their unusually long neck and long legs. Their eyes are said to be the largest with a diameter of 50mm; it helps them to see the predator even from far. However, their bills are quite small compared to their size- 4-5.6 inches. The skin colour varies in the subspecies from dark grey-brown or even crimson red. The legs are featherless and show bare skin while the upper portion of the leg i.e. tarsus shows scales; red in male and lack in the female. Another distinctive feature in two toes on each foot( most birds have four). Outer toe lacks nail. Their wingspan is up to 2 meters. The wings are smooth and soft and serve as insulators. The wings also serve as stabilizers to give them manoeuvrability while running. A large flightless bird found only in regions of Australia and islands of New Guinea. The bird is related to other birds like ostrich and emu as it is proctitis. It is second heaviest with an average weight of 129 lbs (58.5 kg) and third tallest bird with an average height of 1.5-1.8 meters. Even some tallest birds reach a height of two meters. Unlike Ostrich they have a three-toed foot with sharp claws. Cassowaries are frugivorous i.e.their diet include flowers, snails, fish, frog, insects and birds. They use their strong legs to defend themselves by kicking. The bird is also known as double-wattled cassowary due to the shape of its body. It is earth’s second heaviest living bird after ostrich. It is a flightless and one of the most aggressive animals in the world. These fall under the group consisting of emu, ostrich, and kiwi. Their ancestry can be traced back to moa and the giant elephant bird. Cassowaries are very shy in nature and reside in deep forests. They are restricted to New Guinea, north-eastern Australia and nearby islands. Amongst these, the southern cassowary is the largest i.e. 6ft 3 inches and the smallest is the dwarf cassowary. Very little is known about this species though. The female is larger and taller than the male cassowaries. Cassowaries have small wings, no tail feathers, and keratinous quills. Cassowaries are three footed with sharp claws. They have a claw on the second foot. Their wedge-shaped body allows them to run faster. Cassowaries are very good swimmers. Though shy in nature, when found cornered or threatened, the set off a massive attack with their claws which can be very dangerous. Apart from this they also use headbutt and kick. Cassowaries are great jumpers. The most distinguishable feature is their keratinous casque. It is a secondary sexual character and is spanned by fibres. This casque also protects the skull during attacks. These are one of the lowest frequency call birds. The cassowaries are complete fruitarians and live up to 40- 50 years. The male carries the incubation process. This is a strange phenomenon seen only in Casuariiormes. During the incubation period, the male never once leaves the eggs. It doesn’t eat, drink or defecate. It only stands to turn the egg. A bird found in Australia only. It is the second largest living bird if we consider height as a parameter. Two subspecies of emu-Tasmanian emu and King Island emu became extinct in 1788. It is a bird which is brown in colour and is soft-feathered. Its height reaches up to 1.9 meters and average weight lie between32-40 kg. Emus can travel long distances and they can even sprint at 50 km/h. They survive by eating plant and insects. They can live for many days without any food. Breeding takes place in the month of May and June. Emu is the third largest land bird. They are flightless and also listed as wonderful Australian animals. Emu is the only living species of the genus Dromaius. These are soft feathered, flightless and can grow up to 5.2 ft. The birds are good sprinters and can travel 50km\hr. The wingspan is up to 8 inches; this stabilises their moment while running. They are usually stout bodies, long-legged and both sexes are greyish brown in colour. Like cassowary, these are three-toed with claws. Their legs lack feathers. The unique feature of emu’s feather is the double rachis emerging from the same shaft. Emu weighs up to 70 kg. There diurnal and mostly eat plants and fruits. Emu mate for life; the male incubates the eggs for around 60 days. Their mating season in December – January. A unique feature is the emu egg. It is elongated and dark green in colour. It is usually 13 cm long. Strangely similar to cassowaries, during the incubation period the male never once leaves the eggs. It doesn’t eat, drink or defecate. It only stands to turn the egg. One of the world’s most amazing animals and the largest birds found on our planet. This Emperor penguin is the tallest and heaviest amongst the family of penguin. Both males and females have black coloured back and a white stomach. They are found in the coldest continent of Antarctica. Penguin breeds and lives in the place of harshest weather. They come under the category of carnivores. They have an average lifespan of 15 to 20 years. Penguin weighs up to 88 lbs. They travel approximately 50 miles to reach an ocean where they get their food i.e. they feed on fish and krill in the ocean. These are the third heaviest bird and can grow up to 122 cm. Penguin is found exclusively in the polar regions. Their character feature is the snow-white belly, pale yellow breast and dark yellow ear patches. The wings are flattened and stiffened into flippers allowing an easy moment in the waters. Their body is streamlined. These can withstand extremely cold temperatures, can dive in water 535mt up to 18 minutes. They have a very unusually haemoglobin structure which functions even in less oxygen supply. The tongue is barbed preventing the escape of the prey. The penguin nest in colonies, hunt together and are active both during day and night. They are mighty predators both in land and water. Penguin is able to breed only at the age of three. A peculiar behaviour of the emperor penguin is during the mating season the male searches for a certain special and suitable pebble for the female whom he finds good for mating. A single egg is laid at a time. The male carries incubation and is the only penguin species that breeds in winters. The hatchlings are covered with silver grey fur. Their diet only consists of fish and crustaceans. An emperor penguin can live up to 35 years. One of the largest birds which are found in eastern South America. It is a flightless bird with a lifespan of 15 years. It has a weight of 50 lbs. They have an omnivores diet. The greater Rhea is one of the largest birds which is found in South America and is comparable to Ostrich and emus. They like ostrich use their long and powerful legs in times of trouble and danger. Though their long and large wings which are useless for flight, help these birds to maintain balance and change direction while running. Female rheas lay seven to ten eggs according to one egg per day. A largest flying bird found in the region of Africa. The Kori’s body has brownish grey and white colouration and has a fine patterned on its body with black and white colouring. Kori Bustard lives throughout eastern and sub-Saharan Africa. They usually live near water sources and in areas where there are trees available where they can take shelter. In Africa, Kori Bustards are the heaviest flying birds. Kori breed in the months from April to June. The sexual maturity in this bird reaches after 3 years of age. Mainly found in dry grasslands of the steppe, bustards can grow up to 150 cm. These are one of the heaviest flying birds. The male weighs 30% more than the female. This is one of the few species showing SEXUAL DIMORPHISM. They are predominantly omnivores. They are generally husky brown in colour. These have a broad wingspan with fingered wing tips. They show a peculiar mating display such as inflating throat sac. The female lay 3-5 eggs and incubates them alone. Bustards are endangered species and are hunted for their feathers and meat. A world’s third-largest biggest bird and largest species from pelican family. This bird comes under the category of the biggest birds which can fly. Its average weight is 11.5 kg and a stands 5 to 6 feet tall. They have a long wingspan of about 300 to 350 cm long. Dalmatian Pelican has two geographical regions depending on its two breed – first breed in eastern Europe and winters in the eastern Mediterranean region while the second breed in Russian and central Asia and winters in Iran, Iraq and Indian Subcontinent. The bird’s breeding season comes in March and April. Their distinctive appearance is due to their bill, peak pouch and unusually large wings. They have exceptionally pale plumage and rarely light brown (peruvan pelican). The slender rami of the lower bill and the flexible tongue cast into a pouch tor catching fish and sometimes rainwater. They have fully webbed feet. The wings are large for the purpose of soaring and gliding and a highly unusual number of secondary flight feathers i.e. 30-40. The male has a longer bill than the female. Amongst these, the largest is the Dalmatian pelican found in freshwater ice-free lakes. The Dalmatian pelican has exceptionally white plumage curly nape feathers and slender husky grey legs. They are found in all habitats except in extremely cold and snowy regions. Pelicans socialize more than any other bird and lives in colonies. They travel in flocks, hunt cooperatively and build up large colonies. They resting and nesting depends on the plumage as well. The pale plumage nests on the ground while the grey tends to nest on trees. Their diet solely consists of large and small fishes. Pelicans can live up to 19 -25 years. A bird found in the region of Andes Mountain in South America and belongs to the family of New World Vulture. They belong to kingdom Animalia. Their wingspan is 3.3 m which are 2.3 times longer than their original height and weighs 33 pounds. Their body stands 4 feet high. Basically, the Condor is a scavenger. They normally have a lifespan of fifty years or more. At the age of five to six years, they become mature for reproduction. They lay bluish-white eggs which weigh 280 g and the length of an egg ranges from 3.0 to 3.9 cm. After six months of baby birds which are born to start learning how to fly. One of the highest flying birds in the world, Condors are commonly known as the vultures are the new world species. They have a large broad wingspan that helps them in soaring high. The plumage is uniformly lacked with white feathers surrounding the base of the neck. The neck and above head are exposed to bare skin. The head is flattened above. In the male, it is crowned with caruncle and the white skin near the neck lies folded. THEY ARENT THE BEST Flyers. This is due to their enormous weight. Their diet consists of dead decaying flesh. They have an unusual PARENTING TECHNIQUE. The condor lay a single egg once in two years. They don’t build nest rather lay an egg on a bare cliff. These are one of the TOP ENDANGERED SPECIES. This is primarily because of loss of habitat and pesticide poisoning passing in the food chain. A bird from the family of a swan and got its name mute as it makes less use of its vocal as compared to other species in the swan. A bird found in the region of Eurasia and far north of Africa. Baby swans are called cygnets and they remain in the shelter of their mother for the first six months. Swan at one time lays 10 eggs. Swan is the largest members of the waterfowl family and also they come under the category of world’s largest flying birds. These birds have short length legs but can run fast and even make use of its wings when they are surrounded by danger. Mute Swans is one of the friendliest animals in the world. One of the beautiful creatures in nature is a large waterfowl only found in Eurasia and North Africa. It has a distinct white plumage and a black-bordered large orange beak. There is a knob atop the beak which is larger in the male. These have a very large wingspan of 100 inches. Mute swans are very aggressive when it comes to their nests and territory. They are birds of very low noise and rarely make a hoarse grunting sound thus called mute swans. Due to their angelic features, mute swans have gained a good amount of recognition is art history and literature. A bird with the largest wingspread of about 11 feet. It is one of the world’s best known and most studied bird amongst all birds. They mostly live in groups at a far distance from oceans. But for food, they travel towards the ocean and feed small fish and crustaceans. It is said that they can make shallow dives moving 150 meters deep in water and can stay there for up to 20 minutes waiting for their prey. They spend most of their life while flying and land only to breed and feed. The recorded travelling of one wandering albatross is 6000 km in just 12 days. Since throughout their life they continuously fly so it is difficult to estimate how much they fly during their lifespan. These beautiful large soaring birds found high in the sky are a native of southern and North Pacific Ocean, they have a long wingspan and weigh up to 12 kg. Albatross mostly feeds upon large and small fishes. It is rarely found on the ground and spends 90% of its lifetime soaring and gliding in the sky. It is one of the most beautiful Antarctic Animals. They breed in colonies and lay one egg at a time. They are known for covering long distances. However, unfortunately, they are in great danger. The long line fishing, hunting and climatic changes are acting as a major cause of the decrease in their number. Domestication of turkey has been started in Mesoamerica, however, ancestor of domestic turkey still roams through the woodlands of North America, domestic turkey can be found only on the farms mostly in the areas with a temperate climate. One of the largest birds in the world can reach upto 3.3 to 4.1 feet in length and up to 86 pounds of weight. Males are little larger than females. The bird species is covered with 5000 to 6000 feathers and has a fan-shaped tail covered with 18 long feathers. Domestic turkeys are less colourful than wild turkeys. Turkeys have good eyesight and sense of hearing. The bird species is intelligent and can memorize all parts of its territory. It is said that wild turkey lives on a territory of around 1000 acres. Turkeys are popular as social animals that build strong bonds with other members of the group. Also, they can easily identify “strangers” ( turkeys that are recently introduced into the group) and sometimes act aggressively toward them. Great bustard is a member of the bustard family. The only member of in the genus Otis mostly seen across Europe. Talking about the appearance, the bird species has a grey head and neck with brown back barred with black and underparts are white. The male species develop a reddish-brown breast band that gets bigger with age. Both male and females live in separate groups for almost the whole year, however, they come together at the time of the mating season. The bird species is omnivorous and likes to eat grass, legumes, crucifers, grains, flowers and grapes, however, it has been also seen eating rodents, earthworms, large insects, larvae and the chicks of other species. The eating scenario totally depends on the season. The birds are listed under polygynous, that means one male may mate with as many as five females. Today, they are facing habitat loss because of Increasing land privatization and human disturbance is expected to cause more habitat loss with the ploughing of grasslands. The second largest species of penguin mostly seen on various Sub-Antarctic islands. One of the largest species spends its life in two phases, the first phase includes life in the water where it collects food and the second one lies in the beaches and flat or slightly sloped valleys without ice and snow, where it rests, mates and takes care of the chicks. The bird species can reach 3.1 feet in height and 33 pounds of weight. Talking about the appearance, it has a dark grey or black plumage on the head and back. Also, white plumage on the belly can be seen easily. It likes to eat fishes mostly lantern fish, squid and krill. It can dice upto 160 feet, however, sometimes it is 1600 feet to collect food. It can spend around 5 minutes inside the water. The adult bird has many enemies such as leopard seal, killer whales and large sharks. It has a lifespan of 15 to 20 years in the wild and 30 years in the captivity. 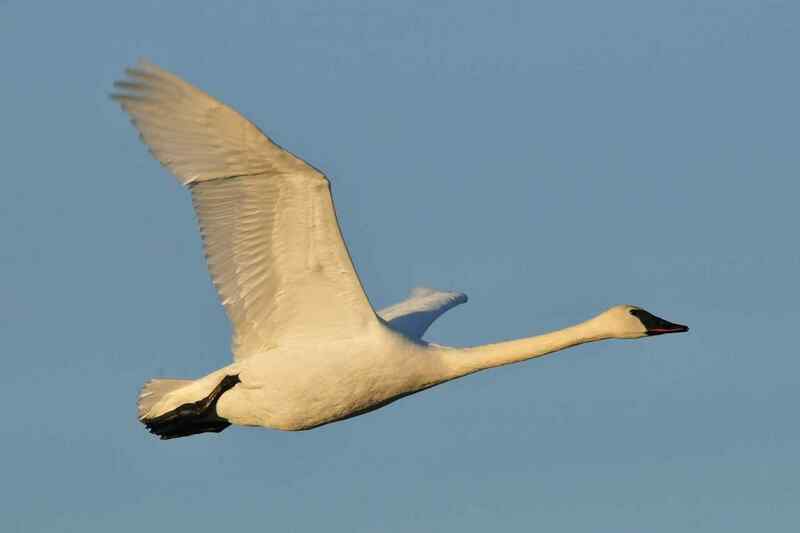 The trumpeter swan is a species of swan and considered as a close relative of the whooper swan of Eurasia. Scientifically known as Cygnus buccinator, the bird species are scattered across North America, i.e., mainly Alaska, Canada, and the northern United States, however, some of them also seen in Wyoming and Michigan. The adult trumpeter swan can be measured up to 130-165 cm long where males can be 180 cm in length and weigh approximately 10.9-12.7 kg, howvever, female can be around 9.4-10.3 kg. The most unique feature is teh presence of black bill that is shaped like a wedge but in some cases, a salmon-pink colouration noticed around its mouth. The bird species can survive up to 12 years in the wild and up to 35 years in captivity. The species love to thrive in lakes, ponds, large rivers, and coastal bays. Trumpeter swan will prepare its nests on slightly elevated ground near a water body. Nest comprises in the shape of a large bowl that has been made with the help of grass, emergent vegetation such as cattail or bulrush. The whooper swan is a large white swan even bigger than Bewick’s swan with has a long thick neck that is usually erect and has black legs. The bird species like to eat Aquatic plants, grass, grain & potatoes. There are two species swan come to the UK each winter, one is whooper swan that migrates from Iceland and another one is Bewick’s swan come from Russia. Both these species have yellow and black bills and it is quite difficult to separate them. The bird species pronounced as hooper swan can grow upto 140–165 cm and have a wingspan of 205–275 cm. One of the heaviest flying birds in the world, with different weight for both male and female species. The male’s species have an average weight of 7.4–14 kg, however, female have an average weight of 9.8–11.4 kg. It requires large water areas to live in. It spends much of its time swimming, straining the water for food, or eating plants that grow on the bottom. Additionally known as Darwin’s rhea, the flightless birds can grow upto 1 metre tall. One of the largest birds in the world likes to eat grass and plants and mostly seen in small flocks grazing with llamas, guanacos and vicunas, however, they have also seen eating insects and other small animals. The bird species are very fast runners that help them to escape predators such as pumas and foxes very easily. During breeding, the male species mate with a female who lay their eggs outside the nest. The males can be very aggressive after looking at their eggs and hence females sometimes lay eggs outside the nest and roll them into the nest with the help of the beak. The bird species were mostly seen in grasslands throughout Argentina, Chile, Bolivia and Peru. The numbers are decreasing because of hunting, egg collecting and loss of habitat used for farming. Also known as the monkey-eating eagle is one of the largest birds and considered as most powerful across the globe. The Philippines’ National Bird is putting all his efforts to conserve the most critically endangered species by imposing a strong law where if you found guilty of killing bird species, it will cost you 12 years of imprisonment or with high fines. The average lifespan of the species is 30 to 60 years, howvever, two of them has been recorded to live more than 40 years. The female species is bigger than the male’s species. The sound produced by the bird is loud and high-pitched that suggests its territorial characteristics. One of the tallest birds in the world can grow upto six feet. There are approximately 15 different kinds of cranes and among all sarus crane is the tallest. It is also listed as the tallest flying bird in the world, however, the weigh of the bird is less. The average weight is approximately 14 pounds. They have a large wingspan and when they are open they are about to be eight feet from the tip of one wing to the tip of the other. Talking about the features, they have a light grey feathers on the top and crown and the head is covered with a patch of light greenish-coloured skin. The bird species were mostly seen in Australia and these Asian countries such as India, Nepal, Pakistan, China, Myanmar, Vietnam, and Cambodia. They love wetlands and marshes as well. One of the largest birds has a flaunting size of 72 cm and also listed as the world’s largest owl. It is popular for its silent discrete nature and amazing characteristics. The bird is rare, howvever, it is magnificent to watch. The bird species is mostly seen in Northern Hemisphere and have awesome hunting capabilities. It is also known as ‘Phantom of the north’ and called by other names such as Lapland Owl, Spectral Owl, Bearded Owl, and Sooty Owl. The bird species is from the Horn of Africa and it is being distorted as the largest bird in the corvid family and also one of the largest birds across the globe. The bird species has a length of about 64 cm and weighs approximately 1.15 kg in females and 1.5 kg in males on an average. Talking about the features, it has a very large bill which is laterally compressed and is deeply curved in profile giving the bird a very distinctive appearance. The species is mostly seen in s Eritrea, Somalia and Ethiopia and habitat includes mountains and high plateau between elevations of 1500 to 3400 metres. These are the largest birds in the world. Birds have always been the undefeated rulers of the sky. Joining the missing links from the prehistoric era they have been of great help. They are one the majestic beauties of nature. But it is a shame that we people are being a threat to it. It is not just the largest birds that are being endangered, but, this is leading to the extinction of life on earth. These are the largest birds in the world. Do post your comments.